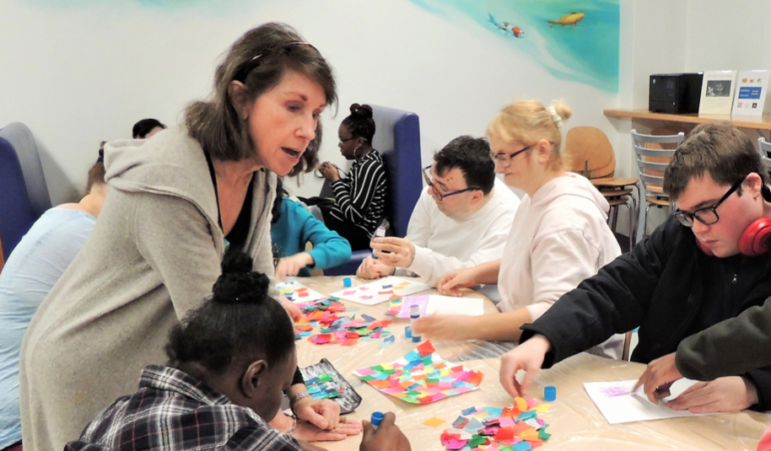 ArtAcademy taps into the transformative power of art for adults with intellectual and developmental disabilities (I/DD) by engaging them in a variety of art classes in an inclusive setting on Silvermine’s campus. This new initiative expands Silvermine’s previous collaboration with STAR held at the Norwalk Public Library where students sampled classes in watercolors, pastels, and collages. On-site classes at Silvermine will enhance the instruction and experience by offering proper studios with special facilities and equipment in a creative environment where STAR participants will interact with teachers and fellow students. “ArtAcademy will offer the resources and pathways for adults with I/DD to explore, develop, and share their talents — and perhaps even discover skills that might lead to career development,” said Robin Jaffee Frank, director of strategy and development at Silvermine. The program fosters not only artistic and social development — but also joy through art. Classes will run weekly throughout winter/spring and fall semesters, with courses in drawing, painting, printmaking, ceramics, mixed media and sculpture. STAR, Inc., Lighting the Way, was established in 1952 by parents who believed that children with intellectual & developmental disabilities (I/DD) were entitled to the same basic opportunities as other children. Today, STAR provides an array of services for over 600 individuals with disabilities, from birth to seniors living in Fairfield County. STAR creates opportunities to live full lives with respect, independence, freedom of choice and personal growth by providing support, services & advocacy to our neighbors and their families. The Horizon Foundation and the Sidney Weiner Memorial Scholarship Fund generously provided inaugural funding for the program. Since its founding in 1997, Horizon supports non-profit organizations that aspire to create and maintain sustainable, vibrant, and resilient communities by enabling children and adults to lead their communities in creative, healthy, and thoughtful ways; educating citizens to be good stewards of the environment; conserving land and water resources; encouraging service to others; promoting visual arts and music, and teaching appreciation of and preserving historic assets. Silvermine Arts Center is one of the oldest artist communities in the United States. Its five-­acre campus in New Canaan consists of a nationally renowned artist guild, an award­-winning school of art offering classes for all ages, an arts and fine crafts shop, and a gallery offering over twenty contemporary and historic exhibitions annually. Silvermine is a non­profit 501c3 organization that also offers an Outreach Education Program, Art Partners, and hosts lectures, film screenings, and special events. Silvermine Galleries are open six days a week from 12 to 5 p.m. and by appointment Friday. For more information, call (203) 966-­9700, ext. 20 or visit the website. Due to popular demand, a Sip and Paint Ladies Night Out is returning to the Darien Arts Center’s Visual Arts Studio on Wednesday, April 24, from 7 to 9 p.m. — an announcement from Darien Arts Center Artist Stephanie Lush-Mastriano will lead this fun and friendly workshop inspired by the famous French artist Edgar Degas, who is especially identified with the subject of dance. A live ballerina will pose as a model for the attendees to use as inspiration to create their own painting. Barbara Pierce Bush drew a capacity crowd of 400 people to the Woodway Country Club in Darien on Thursday, April 4 at a luncheon fundraiser for STAR Inc., Lighting the Way. Bush, the keynote speaker, discussed her book, Sisters First, a New York Times best seller written with her twin sister, and shared stories about life in the White House and attending Yale with the secret service trying to blend in as a college student.